Joining the Airfield Volunteer Fire Service. Interested in being a volunteer and becoming a member of an award winning team? We have opportunities for anybody who is interested in the fire service and/or aviation to join our award winning team to promote and participate with us ‘protecting the world’s aviation heritage’. You should live within 25 miles of Old Warden Aerodrome. You should be available for a substantial portion of the Shuttleworth Collection Flying Display days along with other events and duties particularly throughout the summer months. You should be available to undertake other activities in connection with the operation of the AVFS. Our operational firefighters are trained to become lower category aerodrome firefighters, no previous firefighting experience is required. You should be available to attend at least 50% of our weekly training sessions which are held every Wednesday evening at Old Warden Aerodrome, there are also some training courses held at weekends. You should have a reasonable level of physical fitness. You must successfully complete an assessment day which will include a fitness assessment, practical and physical tests, a written exam and an interview. Non Operational Fire Support Members. Our non-operational fire support roles include first aiders, control and radio operators, fundraising personnel, catering and general support. 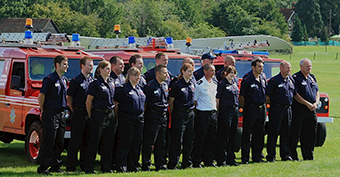 Our non-operational members would undertake training suitable to their role. You should be available to attend at least 50% of our monthly training sessions which are held on the second Wednesday evening of each month at Old Warden Aerodrome, there are also some training courses held at weekends. You must successfully complete an assessment day which will include a written exam and an interview. We are looking for trustees with particular skills in accountancy and fundraising. The AVFS has an equality and diversity policy and we invite anybody who is interested in the fire service and/or aviation to join us. All prospective members will need to complete and submit a copy of the application form to The Administration Officer either by post to the address on the application form or by e mail.